Jam-packed compilation from this crazy Rockabilly cat called Elvis Pummel! Here you find his rare vinyl releases on Voodoo Rhythm, Rumble Mumble and Swamp Room Records + a lot of un-released stuff and a Video of his famous song PLAY IT, MTV!!! 56 more or less short tracks + video + 16-page all-colour booklet! 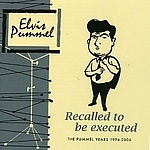 Elvis Pummel - On Board 7"